So many deadlines, so little time. I'm knocking down four articles for publication, opening the shop for the season---delayed by the endless bad weather and a sewer construction project that has deposited more bulldozers, one lane traffic, and orange cones to block the drive than I ever imagined existed, over the last two months, and basically, I am running backwards to catch up, and finishing up a renovation project for a friend that should have completed a month ago. So, backwards I run, never catching up. I promise, promise, promise to come up with something interesting once the Fourth is behind me. In the meantime, a couple of favorite houses on the road to aristocratic Castine, one of Maine's loveliest and historic villages, its streets still shaded by elm trees and lined with handsome white houses and gray shingled cottages overlooking a beautiful harbor. 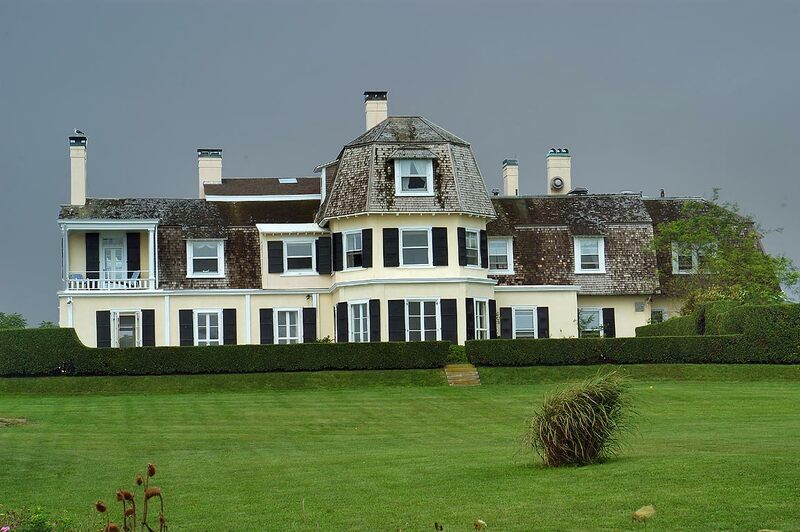 My assignment was to interview the owners of one of the most unusual houses there--but more about that, and breathtaking Castine itself, another day. 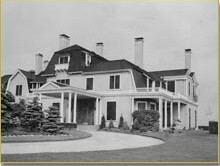 Both of these houses, dating from the first quarter of the 19th century, have that 'just right' quality---the elegance and spareness that characterizes early Maine architecture at its best----gently landscaped without the suburban displays that people nowadays just feel they must have. When did people start forgetting that sometimes what one leaves out is more important than what is added?. For me, this is how an old building looks best in Maine. In Maine, the old houses were usually attached to their barns by a series of sheds, so that one did not have to go outside on howling winter nights to use the privy, collect firewood, or feed the horses. In local parlance, this type of building is known as 'Big House, Little House, Back House and Barn' (an excellent book by that title explores the type further). Along the Castine Road, there are many old capes where this arrangement survives. My particular favorite is the one above, built for a farmer of refined taste, painted a subtle washed gray. In the fifty years that I've been admiring it, it has remained in this perfect state---neither shabby nor tarted up, shaded by massive oaks on its rolling old lawn, sheds and barns rambling off to the side, free of 'tasteful' renovation. Almost across the road, this house also sits unchanged behind its stone wall, having somehow miraculously survived 200 years without the indignities of replacement windows or doors. Behind it, fields slope down to the mouth of the Bagaduce River. The worn white clapboards, hand sawn, give pleasing texture, and the thin muntins and wavy glass of the windows have a delicacy that Marvin cannot duplicate, no matter what they say. The yard is full of old fashioned shrubs. Looking at the huge Kolkwitzia blooming in front, one understands its common name, 'Beauty Bush'. Finally, for Father's Day, the weather was perfect---the kind of day that we have seen far too seldom this year---blue skies, no haze, not too cold, not too hot, a breeze making waves lap gently on the shore---in short, perfect for lunch with parents and sister on the deck at the cottage. Dessert was shortcake, with the first native strawberries of the season, deep red and succulent. One tries to avoid excess in all things. Heaven forfend the Dilettante should ever gild a lily, post too many pictures, drink too much diet Coke, let alone say too much---so I did not include a picture, as I should have, of Land's End in the previous post about Lippitt's Castle in Newport, a grim affair erected on the rocks opposite Edith Wharton's summer retreat---one which she decamped soon after construction of the hulking affair opposite her gate on Ledge Road. Partly I did this in the assumption that Land's End, much published, was well known enough, more so than the two successive neighboring houses that formed basis for my ramblings. Naturally, a commenter plead for pictures of Land's End, and The Ancient, a formidable researcher, came up with many. Such requests, and such heroic efforts, should be rewarded, and herewith, a selection of photos of Land's End, none of which I had to seek out myself. Land's End entrance front after being Whartonized and Codmanized. Land's End was originally built in the 1860's for Samuel G. Ward, the brother of Julia Ward Howe, who was a symbol of pre-gilded age Newport, when it was a summer colony of 'nice' millionaires and high minded intellectuals, and who, like Henry James regretted the loss of the resort of simple fields and seaside verandas. The architect was John Hubbard Sturgis, who coincidentally was married Ogden Codman's aunt (and who would remodel the Codman family home in Lincoln, also later to be done over by Ogden. 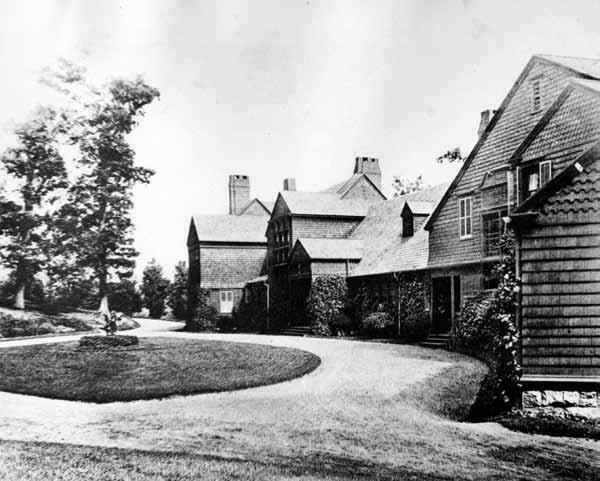 Sam Ward, as would Edith Wharton a generation later, decamped Newport and Land's End for Lenox, Massachusetts, where he built Oakswood, one of McKim, Mead & White's finest early shingle style houses. (Oakswood itself would be replaced by another forbidding Edwardian castle, Shadowbrook, which also went up in flames as did Lippitt's, but that is a different story). And herewith, photos of Land's End as it appeared after the 1890's remodeling by Ogden Codman---whose collaboration with Wharton led to the book which helped change the taste of fashionable America---itself looking a little dated to 21st century eyes. 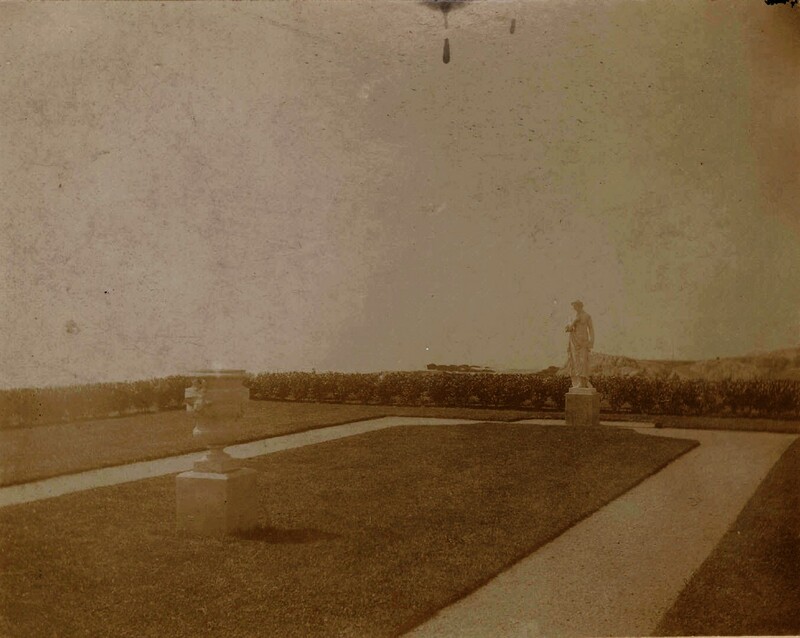 Land's End, view from garden designed by Wharton's niece, Beatrix Jones, later Farrand. The sun room, full of sparkling light from the sea, despite the heavy Louis-Louis valances.. From the windows at right, one assumes that the sun was partially blocked by Lippitt's Castle looming on the near horizon. 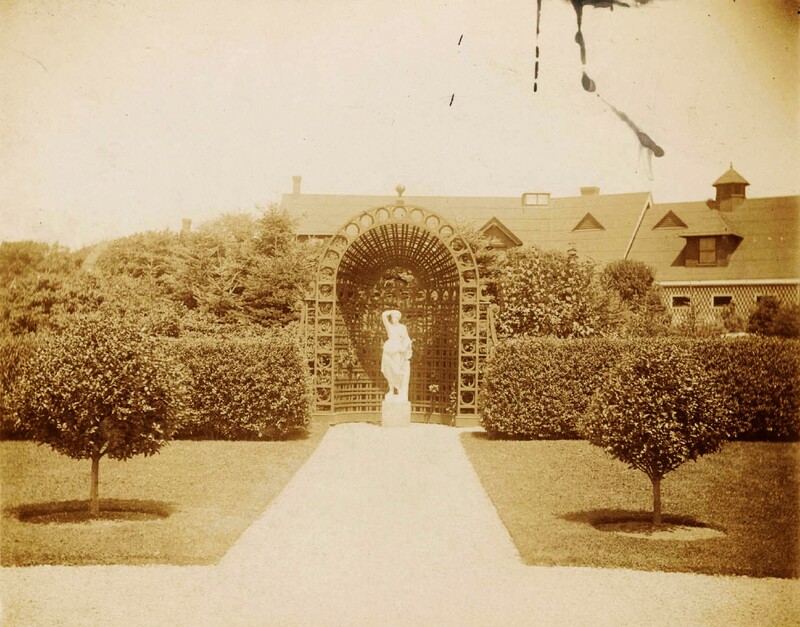 The formal entrance court designed by Beatrix Jones Farrand with Trellis by Codman, replacing the rocky landscape shown in the first view of the entrance front at top of page. 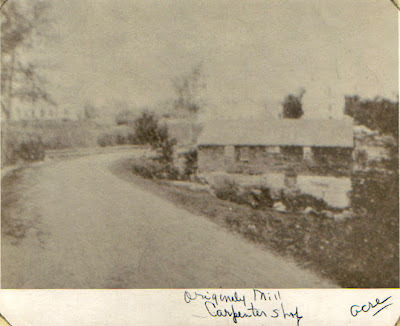 In the background is the stable and coachman's house, converted by a later owner, Mrs. Oates Leiter, to a cottage known as 'The Whim'. Click HERE for an article about Land's End today. Postscript: Two weeks ago, I wrote a post bemoaning some serious cataloging errors in the Historic American Buildings survey. 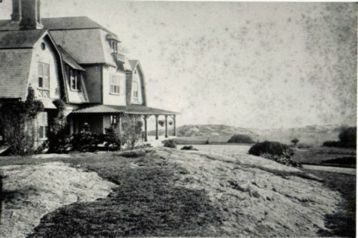 The madness continues, as included in the Beinecke's collection of Wharton photographs is this image, cataloged as of Land's End, but in fact of the August Belmont cottage, By-the-Sea, on Bellevue Avenue.